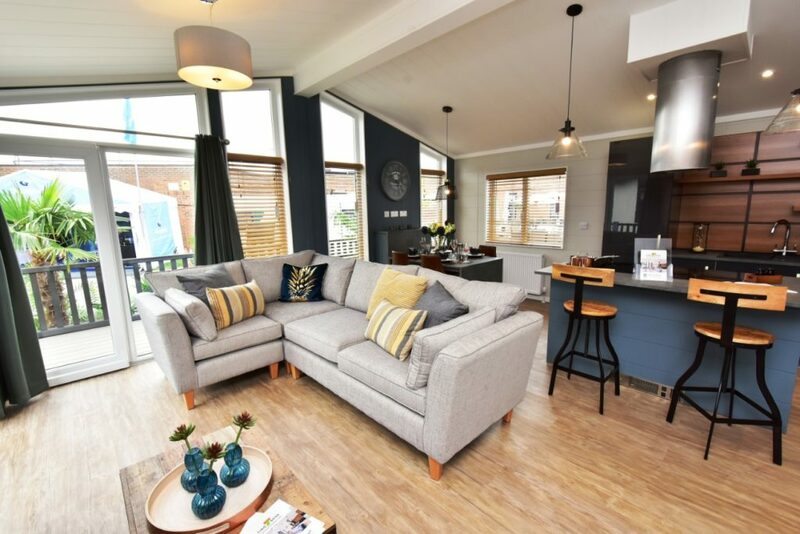 This new holiday lodge from Tingdene is swish in every sense of the word – at a reasonable cost too! 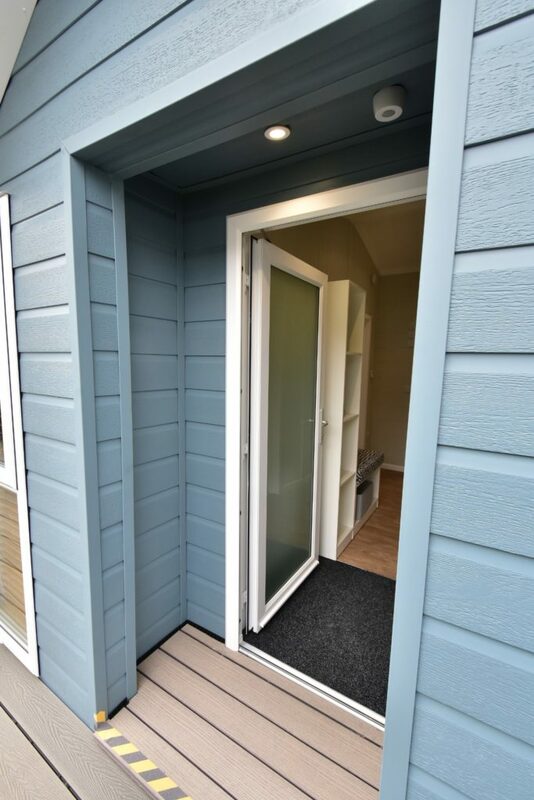 With a 48-year history, Tingdene has produced park homes and also gone into park ownership, as well as the marine sector. 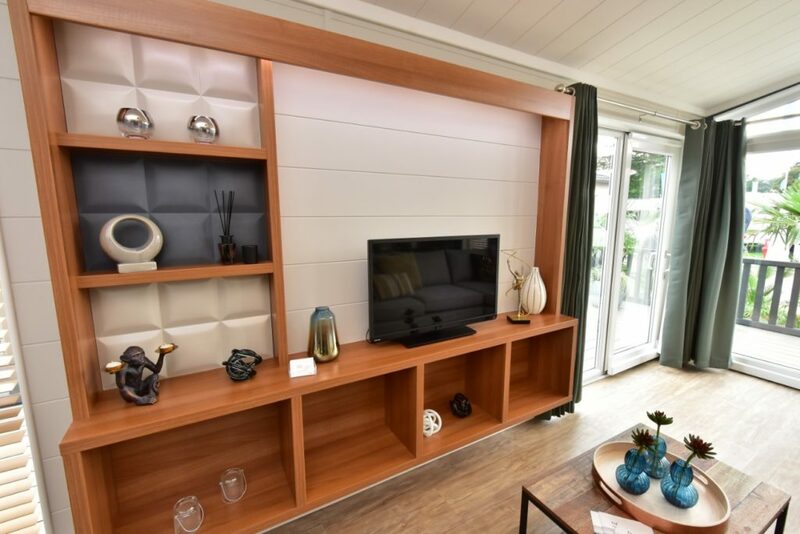 Lodges are one of their other business areas and for 2019 they’ve launched two new models – the Havana reviewed here and the Savannah (being reviewed at a later date). 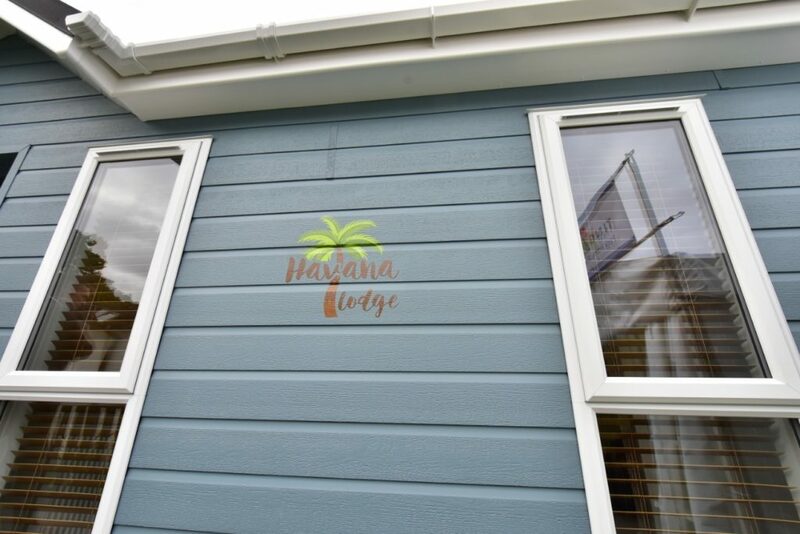 The Havana is a twin lodge and the designers have made the most of the 42 x 20 feet space provided. Built to a residential standard BS3632, all-year round use is not a problem. 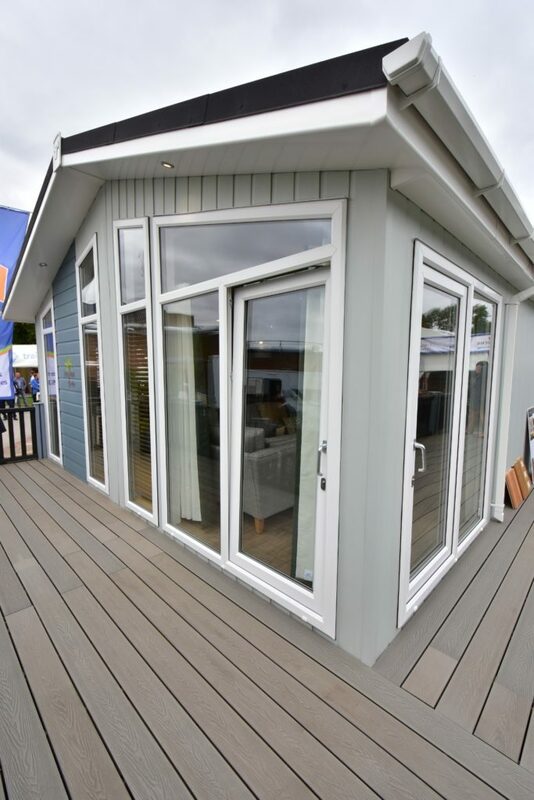 From the outside, the Havana looks pretty good, being clad in Artefoam which can be had in various colours. French doors at the front and side as well as a number of large glass windows flood the lounge with natural light. 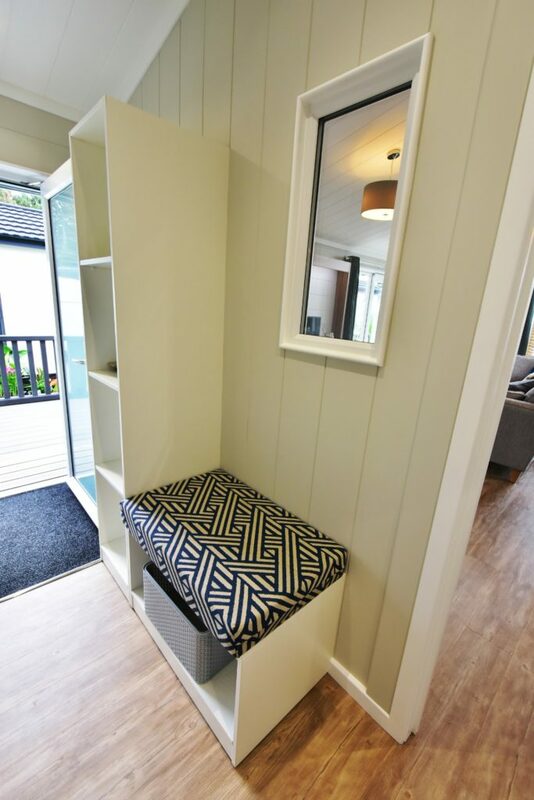 The side entrance offers a porch/hall area with a small padded seat with mirror above and storage shelves for shoes etc. 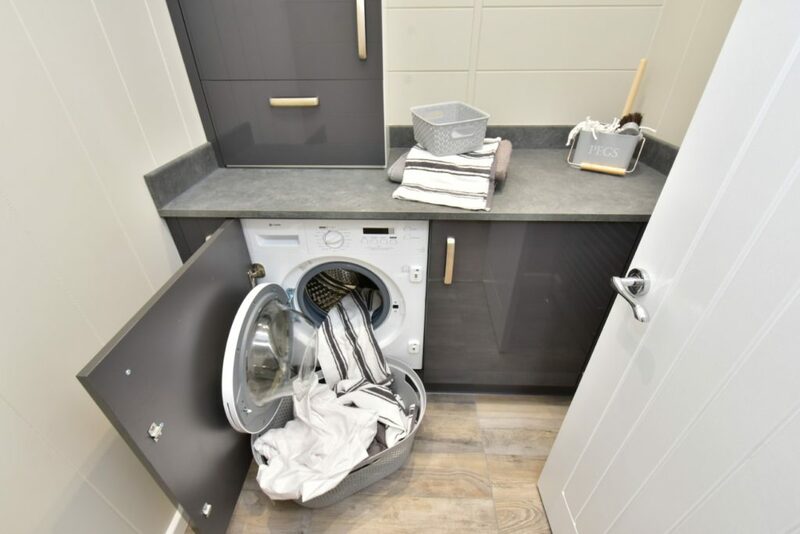 Opposite the hall is a useful utility room complete with a washer dryer – this area can also be used for a wipe down dog area too! Enter the open plan lounge and you’re whisked into an air of swish luxury with all the latest in design trends. 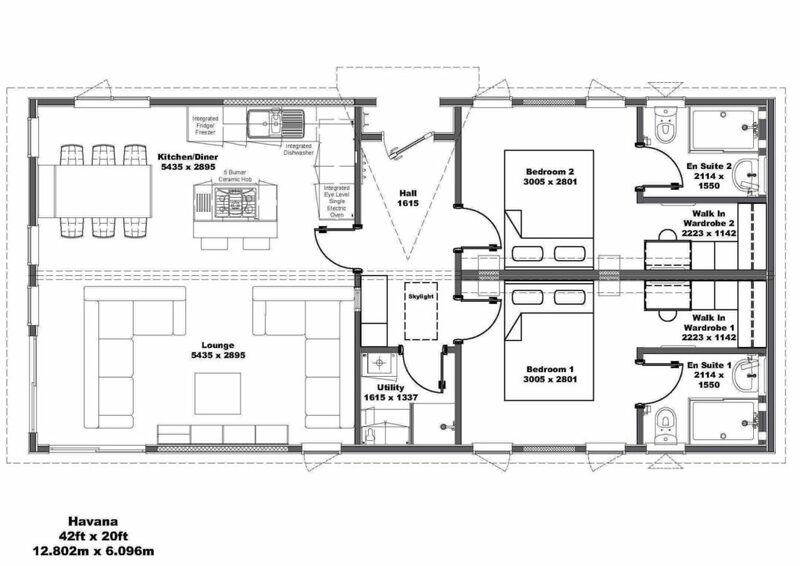 The actual lounge is off to the left with the kitchen on the right and dining area in front with seating for four – a rather smart design/finish. The lounge is sumptuous, with quality sofas and great floor space to the living area. 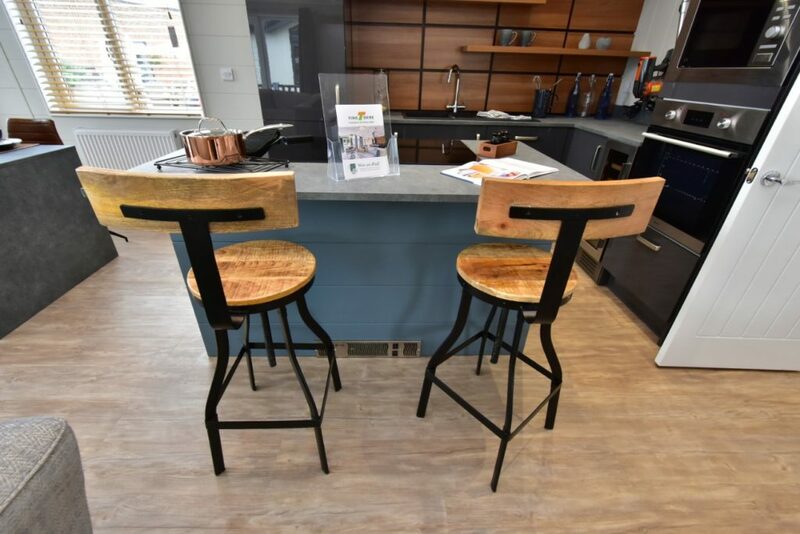 The kitchen comes complete with the must-have island complete with stylish ceramic hob and two trendy wooden bar stools. The main kitchen area is to die for with integrated fridge freezer/dish washer and eye level oven, plus plenty of worktop and storage. We loved the smart wooden shelving – very useful and eye-catching. 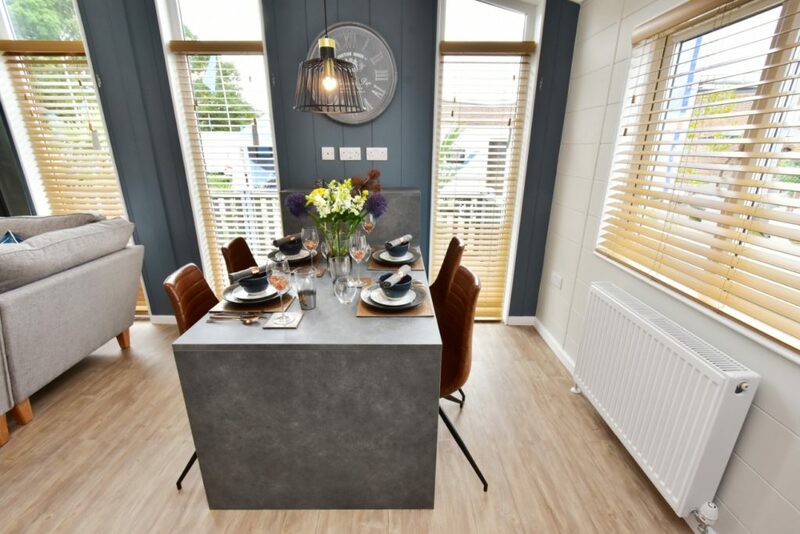 The colour scheme is bang on trend with a mix of greys and blues, and overall is has a modern, loft living, industrial look, with some great designer touches. 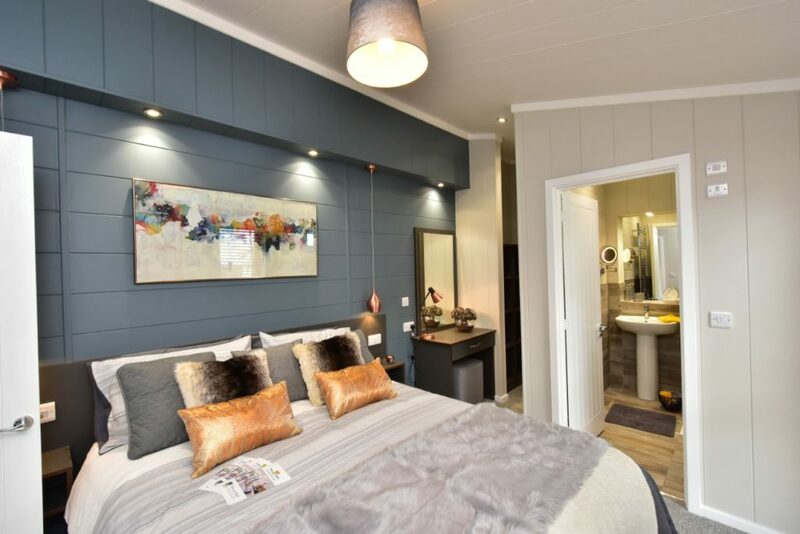 This is a two bedroomed lodge and with the floor area both these double bedrooms are large and again very contemporary in design and blend of colours. Of course both these rooms being the same size means nobody’s room is better than the others – so no falling out here! 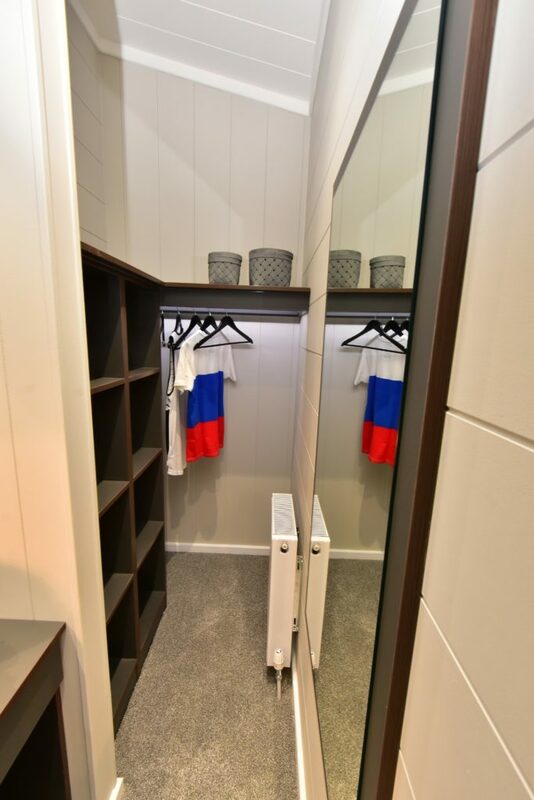 They both feature superb walk-in wardrobes offering plenty of space for holiday clothes, plus shelves placed where they are of use too. There are box shaped bedside shelves, plenty of plug sockets and brass coloured pendant lights drop by the side of the bed – perfect for some bed-time reading! Plus, there’s a vanity area for getting ready for those nights out! As you would expect they have en-suite shower rooms, and a quick word about the night lighting – it’s excellent – though to be honest we don’t see many poor lighting in lodges these days. 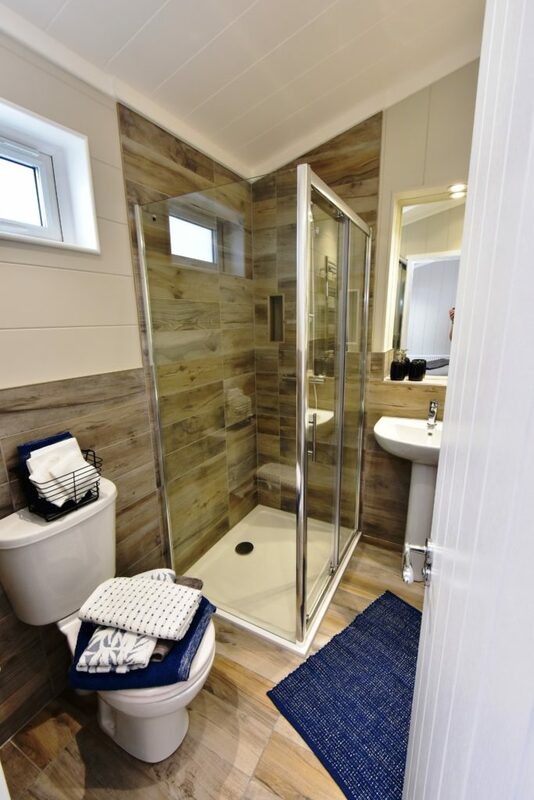 The shower rooms are large and offer a straight walk in shower – it all feels well designed. A large hand basin is fitted and overall both shower rooms are well-planned. You can also choose to replace one of the showers with a bath if so desired. 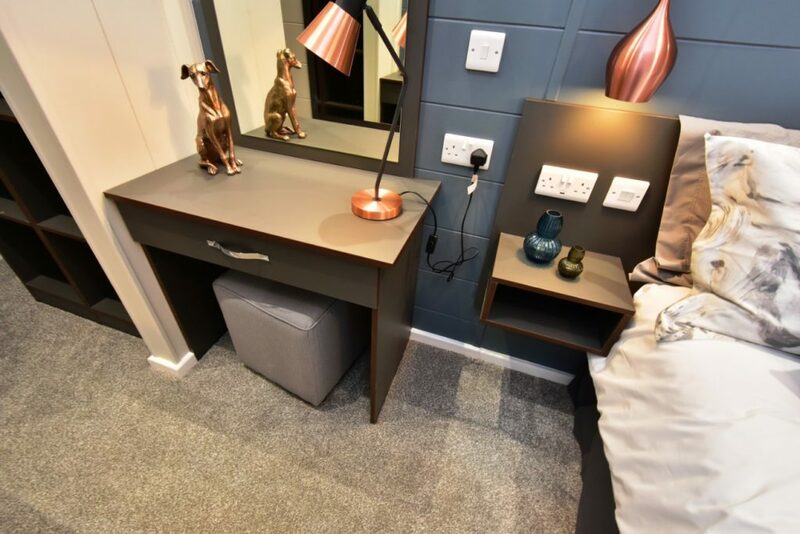 The double bedrooms can also be replaced with twin beds too – so there’s a degree of flexibility when ordering the Havana. This is a first class lodge which is no doubt going to be a top choice in this market for buyers. 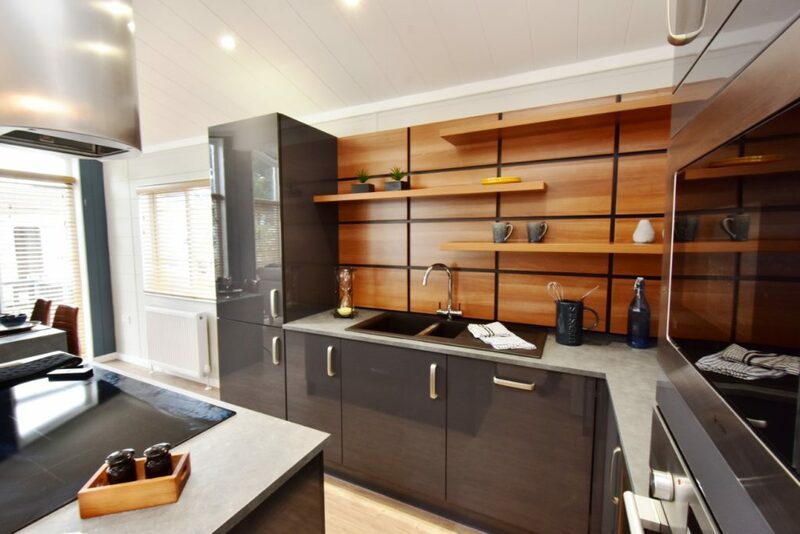 This twin lodge has real style and you could imagine being on a seaside plot entertaining friends with that super kitchen. 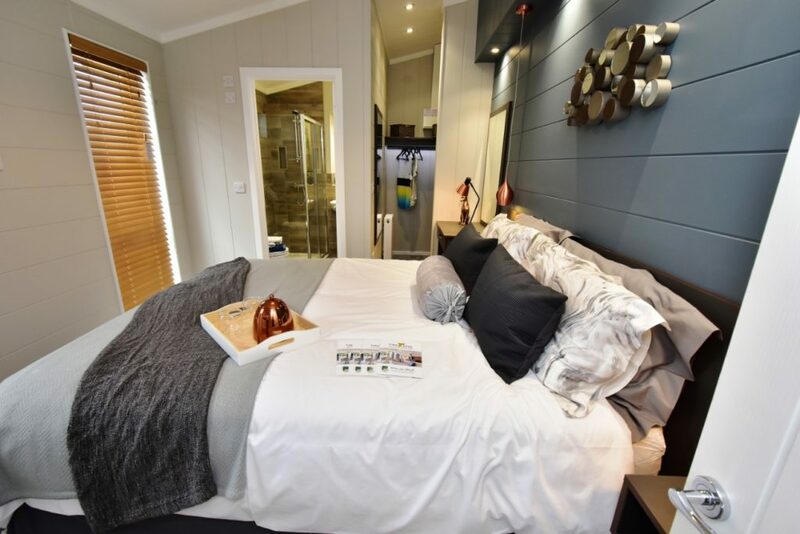 With a large amount of choice we feel Tingdene is a class leader in this area and with some useful changes for some owners such as bed options the Havana has lots going for it. Plus points; Great sized bedrooms, spacious lounge area with useful wall mounted shelving, luxury kitchen and overall a great lodge. Minus points Visitors will have to walk through your bedroom to use the loo! In a nutshell Ideal for couples who want to invite friends or family for weekends. The designer style will impress most buyers – it’s also great value! Key optional extras: The Havana can be ordered as the buyer requires options, so different sizes can be ordered to plot size. 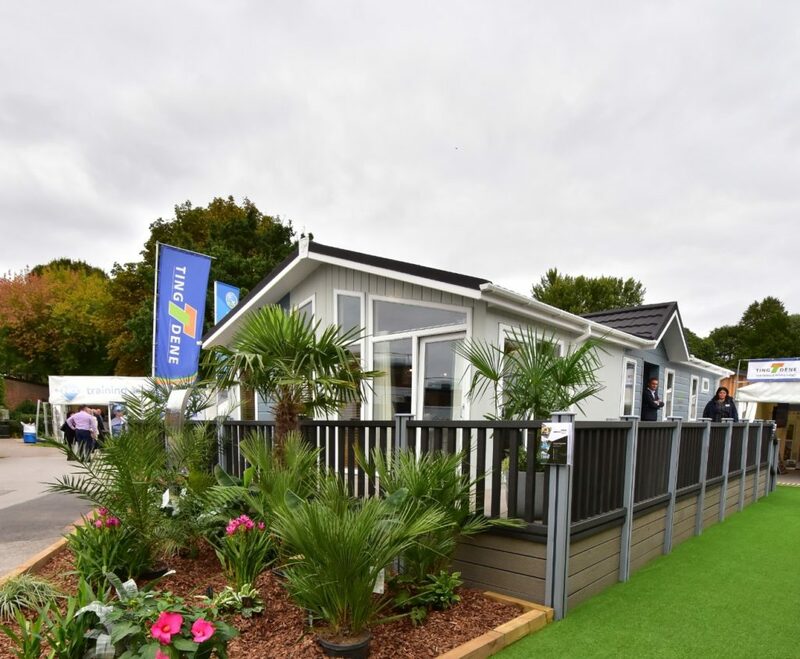 If you’re looking to buy this static/holiday Lodge why not get a great deal insurance quote from us today. Click here to get your quote online. For more information visit www.tingdene.co.uk or call sales on 01933 230130.